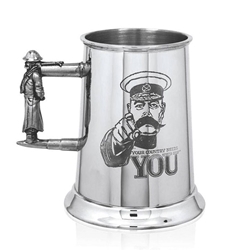 Our Your Country Needs You One Pint Pewter Tankard measures 5.11 inches tall by 3.14 inches wide. Part of the First World War Commemorative Collection, this tankard is engraved with the iconic "Lord Kitchener Wants You" advertisement. The image is considered one of the most iconic and enduring images of the war. A hugely influential image and slogan, it has also inspired imitations in other countries, from the United States to the Soviet Union. Supplied complete with a gorgeous cream and black presentation box and guaranteed not to tarnish over time, this truly is a perfect gift for someone special to you. This great tankard can be engraved by adding your own personal message by your professional engravers.